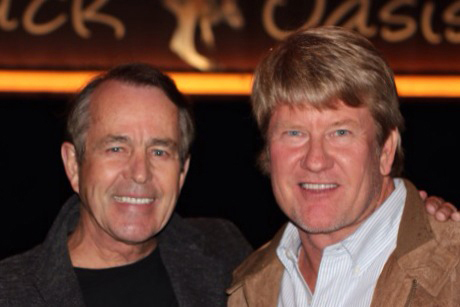 Jim Stafford singer of "Swamp Witch", "Under The Scotsman's Kilt", "Spiders & Snakes", "My Girl Bill", and "Wildwood Weed" was a special guest for a recent fundraising event at Outback Oasis. Jim Fowler famous for his years as co-host, and later host, of Mutual of Omaha's Wild Kingdom shared many of his famous adventures with Paul. 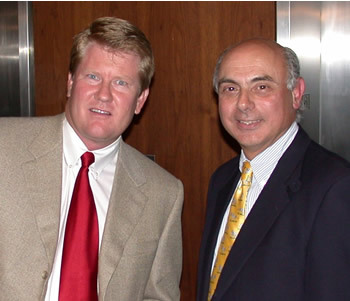 Jim not only appeared on the Tonight Show with Johnny Carson over fourty times, but also had a very memorable appearance on the Jerry Sienfeld show.Today Jim is very active promoting conservation. On March 6, 2013 Jack Hanna was the guest star of a fund raiser for Tampa's Lowery Park Zoo. 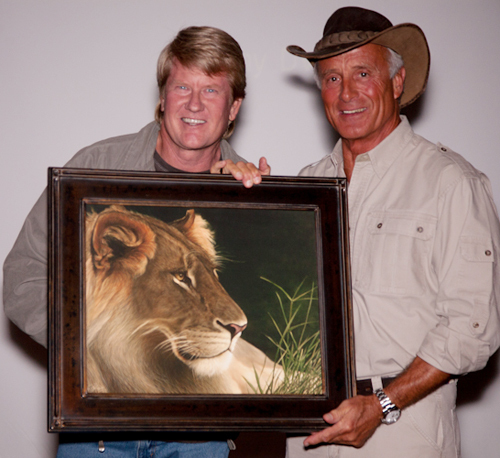 Jack Hanna was presented with Paul's lion painting as thank you for his work promoting zoos and wildlife conservation. 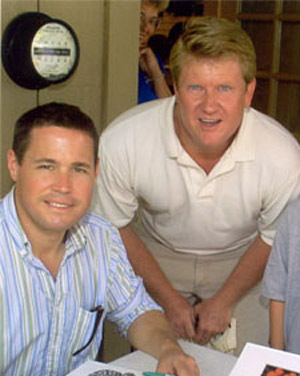 Ironically, Paul knows Jack Hanna's TV show producer, Buddy Litton, through his cousin Dr. Jon Donaldson. 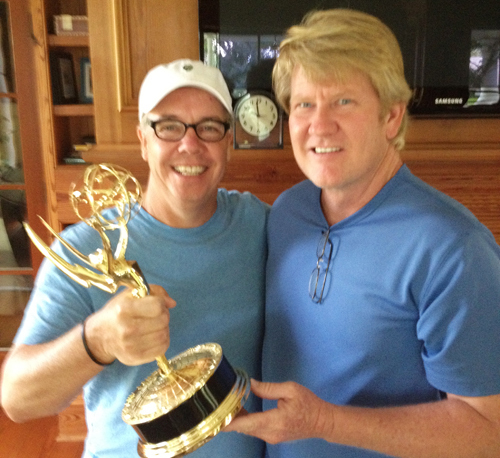 Buddy won an Emmy this year for Jack's show that he proudly displays on his mantel in his beautiful Charleston, SC home. Litton Entertainment produces 20 popular TV shows. 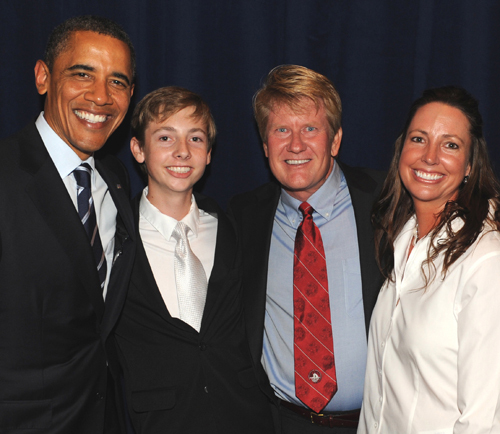 My family and I had the incredible opportunity to meet the President at a private event in Orlando, Florida. My son got to ask the President about Area 51 to the amusement of Obama and his secret service agents. The President left with copies of my Spectrum of Life poster for his daughters and a signed copy of my book, "Under The Panther Moon". Jeff Foxworthy has my artwork hanging in his Georgia lake house. 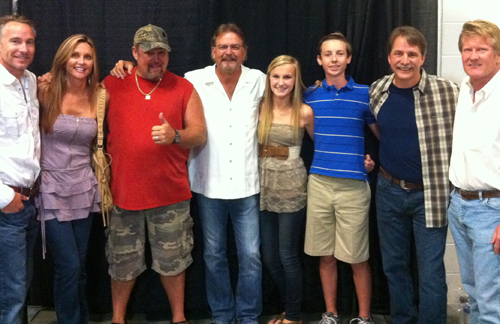 He was kind enough to comp tickets to his Tampa show for family and a few friends. 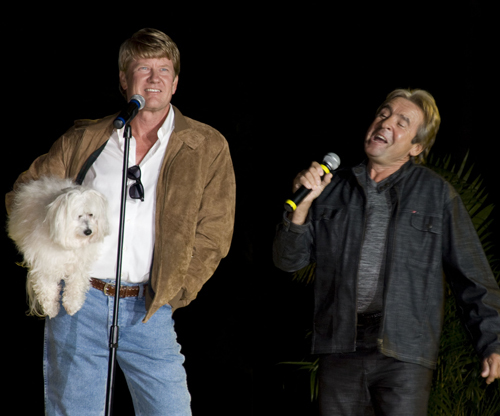 Davy Jones surprised friends when he joined me in a duet of "Day Dream Believer". 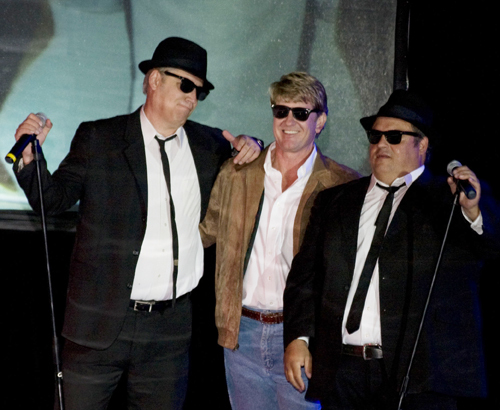 The performance occurred in our backyard after a warm-up set by the Universal Studios Blues Brothers. Davy hung out for a couple of hours to sign autographs and to take photos with the crowd. Davy Jones passed away this year, 2012 - at age 65. 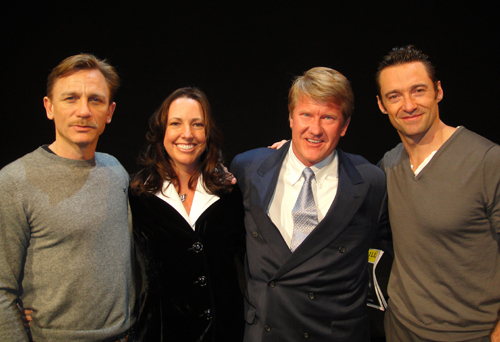 Got to visit with actors Hugh Jackman and Daniel Craig after their performance of "A Steady Rain". Yes, Paul was really on stage with the Beach Boys! 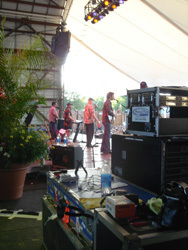 The Beach Boys performed at Cypress Gardens. 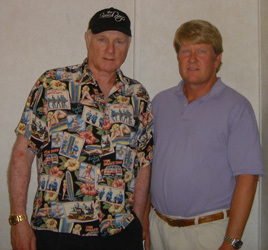 Paul's friend Dr. Tom Emmel grew up with the Beach Boys and has remained friends with the lead singer, Mike Love. Through Tom, Paul was able to visit with the band before the show and was invited to sit on the side of the stage with Mike Love’s wife during their performance. 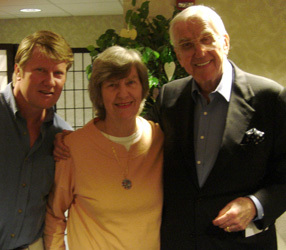 Paul had a fun afternoon with his parents, Bert and Helene, at special Johnny Carson/Tonight Show Tribute hosted by Ed McMahon. At the end of the show, Ed’s side kick came into the audience to field questions. 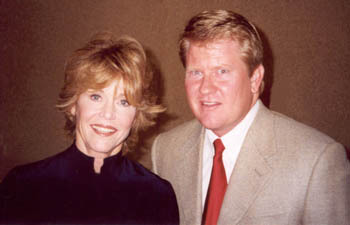 When Paul raised his hand, the man turned to him and said, “You look just like Glen Campbell.” Paul’s reply was, “I usually get Robert Redford.” Ed McMahon promptly replied, “N-e-x-t.” After the show, Paul and his mom had a moment to thank Ed personally for the memories. 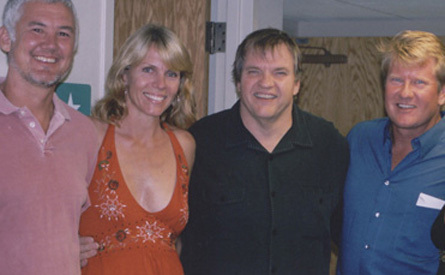 Paul, his sister-in-law Kim and her husband John, had great tickets for Meatloaf’s concert at Ruth Eckerd Hall in Clearwater, FL. 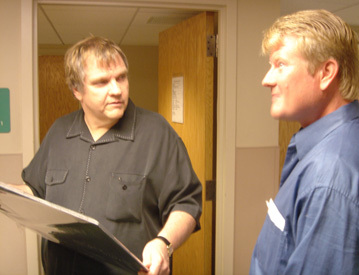 After the show, we all had a chance to meet Meatloaf and Paul gave him a “Grove Patrol” print. Paul and son, Alexander, got to meet the host of Animal Planet's program The Jeff Corwin Experience this past Memorial Day weekend at Cypress Gardens. Jeff visited the park for the grand opening of the new wildlife exhibit, Nature's Way. Paul passed along some of his artwork, in particular two snake pictures. Jeff seemed excited to receive the pictures and remarked that they would hang in his office because his wife has banned snake pictures from the house. Paul mentioned to Jeff that they have a lot of coral snakes on their homestead. The coral snake is notorious to Jeff because it is the one poisonous snake to have bitten him in his many years of handling dangerous reptiles. 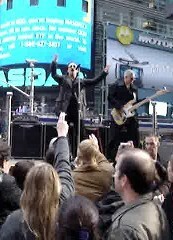 Rock group U2 surprised New York City with an impromptu concert in Times Square. 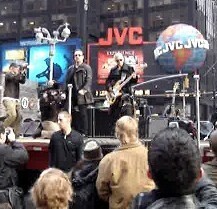 Paul is in the middle of the picture in the tan leather jacket. 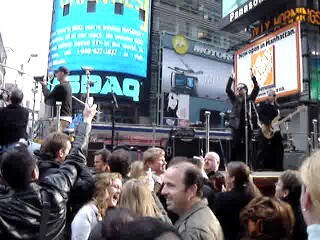 The band was promoting their new album and shooting a video. 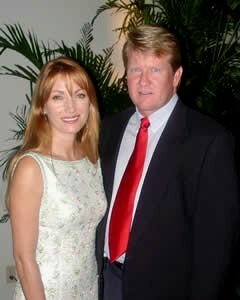 Paul had a chance to visit with actress Jane Seymour, this year's special guest speaker at the Winter Haven Hospital Fall Gala. Paul gave her a signed copy of "Under the Panther Moon" and a couple personalized art prints. Jane Seymour signed some of her children's book on the occasion and talked with Paul about their mutual interest in artwork. Among Jane Seymour's memorable movie roles, she starred alongside Roger Moore in the 1970's James Bond movie "Live and Let Die." 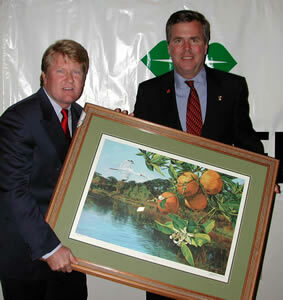 Florida Governor Jeb Bush was presented a Paul Schulz "Valencia Morning" art print at the Florida Citrus Showcase's annual Governor's Day Luncheon. 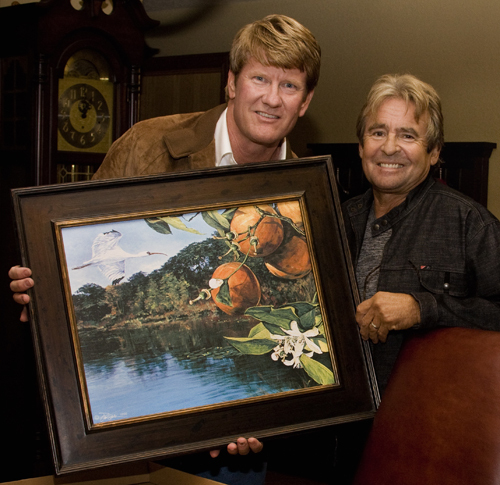 Florida Commissioner of Agriculture, Charles Bronson, was also presented a Paul Schulz art print, "Valencia Harvest." Over 425 industry representatives attended the luncheon at Winter Haven's Nora Mayo Hall. Former heavyweight boxing champion Muhammad Ali, poses as the recipient of a punch from Winter Haven artist Paul Schulz. 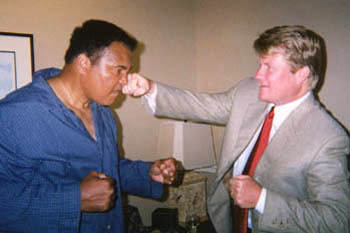 Paul Schulz's efforts to raise money for Emory University brought him a special bonus - a visit with boxing great Muhammad Ali. On a routine visit to Emory University Hospital in Atlanta, the Winter Haven artist had the opportunity to meet the former heavy-weight boxing champion who was making one of his regular visits to the hospital for a checkup. Ali, recently in Atlanta for his six-month checkup, met Schulz while resting in his room at the hospital. During the hour-long meeting, Schulz talked to Ali and watched as the retired boxer met with his doctor. Schulz said he was fascinated by his visit with Ali, who suffers from Parkinson's Disease, a degenerative neurological disorder that destroys brain cells that produce a chemical important for movement. He said the highlight of the meeting came when Ali, who has trouble performing tasks deemed simple to others, attempted to sign an autograph. "He can still sign perfect autographs," Schulz said, "but he doesn't usually sign autographs because of his condition." Schulz said Ali still has a humorous side that was projected in past television appearances. During their meeting, Ali pretended to nod off as he and his doctor were in the middle of a discussion. Schulz and Ali even joked about 59-year-old Ali's recent comments that he would make a boxing comeback at 60. "It is evident he still has the fire and humor he always had," said Schulz, 40. 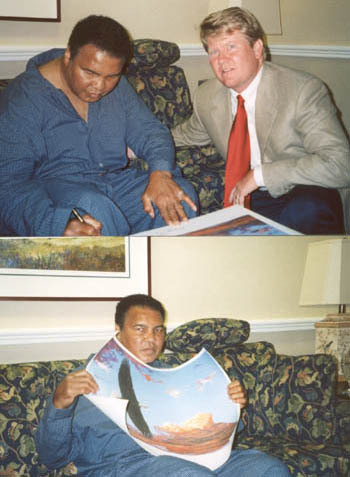 Muhammad Ali adds a Paul Schulz "Emory Eagle" art print to his collection. Schulz said the meeting with Ali who is self-heralded as the greatest boxer of all times, was considered a bonus by the university for the work he does. Schulz makes frequent visits to the university to help raise money to bring Dr. Guy Bouvier, a world-renowned neurologist from Montreal, to the school to teach his methods of selective denervation. This procedure allows people with extensive nerve damage to live better lives. Schulz is a living example of Bouvier's work. The procedure he performed on Schulz has given him a second chance on life. "I still fight small spasms," he said, but those spasms are "nothing like what I used to suffer." In 1993, Schulz developed a disease known as spasmodic torticollis. Through doctors and research, Schulz learned the disease was caused by fluid leaking from his brain onto several nerves in his neck. That left him with limited movement in his head, which was slightly turned to the side as a result of the damage. Since the surgery Bouvier performed, Schulz has regained some movement. That is why he is leading the way to get Bouvier to Emory. "He can share his expertise with a world-class facility in the U.S.," Schulz said. This article appeared in the Winter Haven News Chief on July 2, 2001. 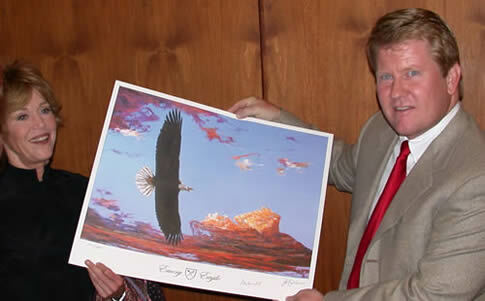 Paul Schulz "Emory Eagle" prints were given to all the guests who attended the opening reception and press conference. The Fonda Center will focus on adolescent sexual issues and reproductive health. The fundraising for the center has begun with an initial gift of $2 million from Jane Fonda. Pictures as follows: Right, Jane Fonda and Paul; Bottom-Right, Paul and Michael Johns, MD (Director of Emory University Health Sciences); Bottom-Left, Jane Fonda and Paul pose with "Emory Eagle" print. 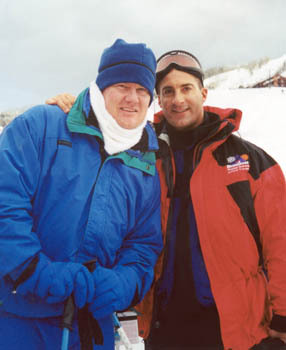 Paul's chance meeting of a lifetime (with the exception of the distinguished celebrities above) came on the slopes of Steamboat Springs. The Weather Channel's Jim Cantori was on location filming an episode of Atmospheres when Paul said, "Look, there's Jim Cantori !!!" Needless to say, Paul's wife Carole Ann had camera in pocket and took the treasured photograph. Jim was an exceptionally nice and fun-spirited guy who really seemed to get a kick out of this crazy guy calling out his name and proceeding to tell him his favorite Jim Cantori Hurricane moments. Paul said, "Remember the time you had the 5 AM spot to report on Hurricane Opal and you freaked when it was approaching Cat 5 status? You called it a Hurricane Camille situation." Jim nodded and said yeah but thank goodness it wimped out to a Cat 3 before it blasted the Florida panhandle. Paul said, "We'll see you at Anna Maria, FL when you come down to cover the big one that's going to wipe out our beach house."